banana | What is That and How Do I Eat It? Over a year??? Over a year since I’ve been on here?!? I’m officially fired, I suppose. But I’m full of excuses (bought a house, construction on new house, two toddlers, brand new built-by-hand-from-scratch complete urban farming oasis of which I hope to grow many things to share with you, excuses, excuses), and I have not been completely absent from my food and camera this whole time, just absent from my blog. But I’m here! I’m here! Yowp! And I have so much deliciousness to share. 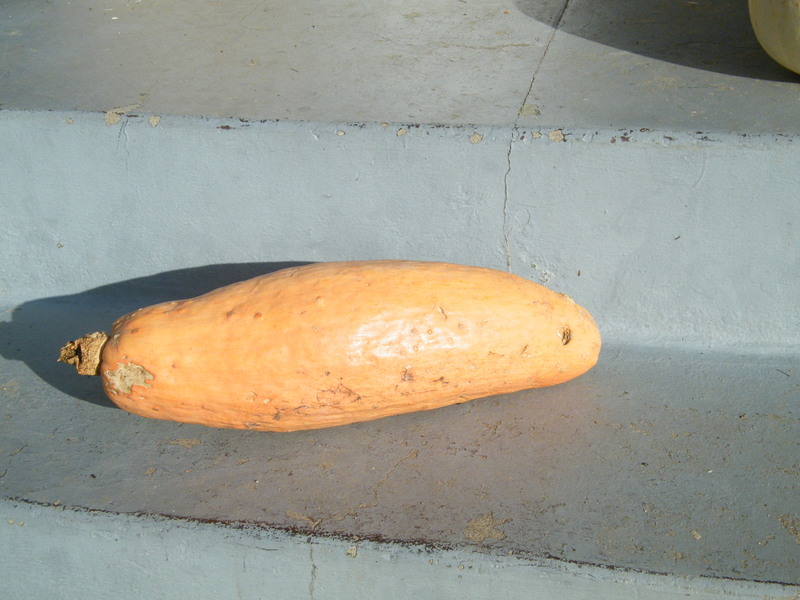 First up: This funny-looking squash. Admittedly, we bought it for a Halloween display. It looked to me like a swaddled baby (perfect for that extra creepy touch to a Jack O’Lantern massacre!) but, much like everything else, time got away from us in October and the baby never came to be. Luckily for all concerned (including the early colonists, I suppose), squashes keep! So two and a half months later, we sliced it up. It turns out it is NOT a Swaddled Baby Squash. It’s either a Pink Banana or a Georgia Candy Roaster, though it seems those names might just be interchangeable. But come on. “Hey kids, would you like a banana squash salad for dinner?” sounds like a bad episode of Chopped and potentially some sort of smoothie. “Hey kids, have some nutty baked Candy Roaster!” Sold! I don’t always like squash. Patty pans and several summer squashes are nasty and mealy, and winter squashes can sometimes smell like cucumber and taste like mush. And that quality that made them so valuable to the colonists (Feed a crowd with one giant vegetable!) can be, frankly, annoying to a modern family that does not want to eat the same punk squash for the next 43 days. Plus, you need to be an ogre to chop into the darn things. I don’t own a cleaver or an axe, and if you’ve seen my history with knives, that’s probably a good thing. 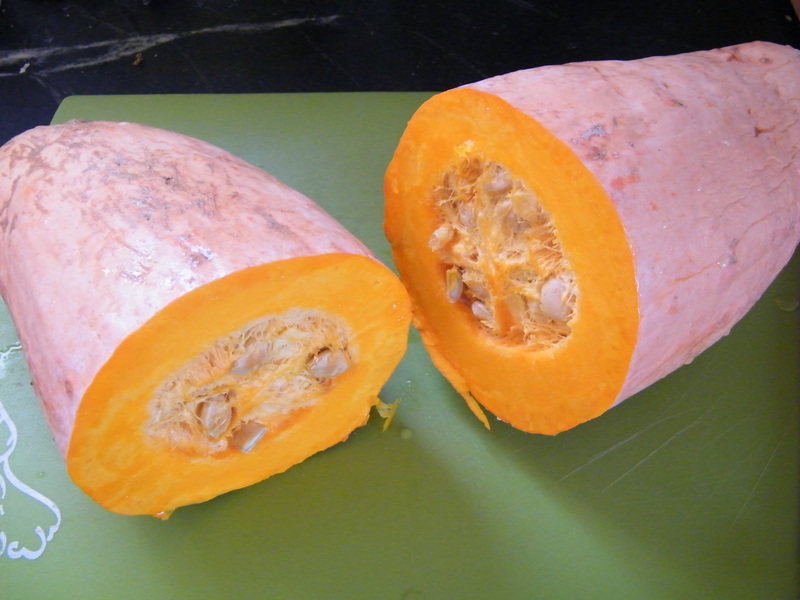 The seeds are pretty easy to scoop out, and the stringy goo not as stubborn as some squashes. You’ll be able to feel the difference between orange gunk you don’t want and orange flesh you do – the strings are very slimy and mushy, where the meat part of the squash is very hard and will crunch a little when your spoon goes too deep. Clean it completely, and you’re good for roasting! You can roast it giant hunks (great if you want to make a mash, a puree, or use in pies – it’s a great alternative to pumpkin they say, if not even tastier, in baked goods) or slice it first. We sliced it into half moons in order to fit them on our baking sheets, though the circles looked prettier. Drizzle olive oil on top or toss in a little oil to prevent sticking. (I cook almost everything on aluminum foil in our house because I hate cleaning pans, but you only need to do this if you’re as lazy as I am.) Bake in the middle rack of the oven at 375 until very soft, about 50 minutes to an hour total, flipping halfway through. If you can get this gorgeous carmelization on there, do. It’s delicious. If I can figure out a better way than luck to ensure it, I’ll update this post. About half my slices came out like this, and the other half still orange but cooked through, so out of the oven the pan came. The raw squash smells a bit like cucumber and banana, of all things, but when roasted it’s sweet and nutty, with a touch of bitterness like when you accidentally eat a walnut shell. 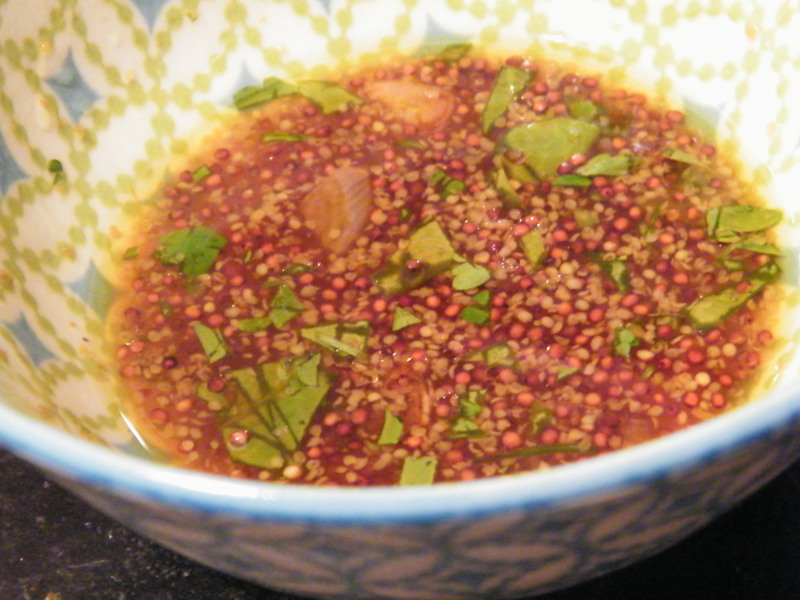 I didn’t like that aspect of it very much, which is why I went searching for some recipes with good acidity and maybe a little sweetness to offset it. And I found a winner! 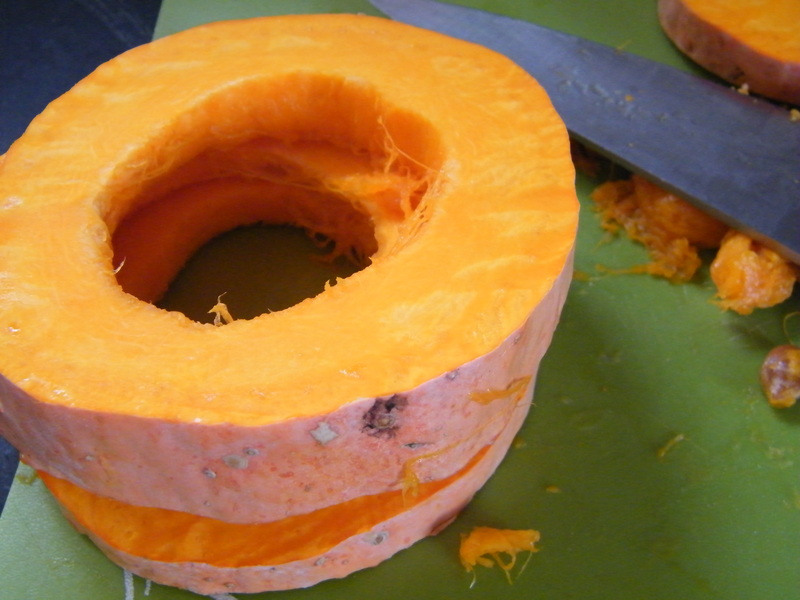 The original recipe was from Real Simple for a butternut squash, but I thought it would adapt well for the Candy Roaster. Mizuna, arugula, or other mesclun green (baby mustard, baby kale, or other spicy/peppery leaves should do well) – measurement depends on how much greens you want. For a side dish, I would do about 3/4 cup. For a salad, I might go as much as 2 cups of greens. 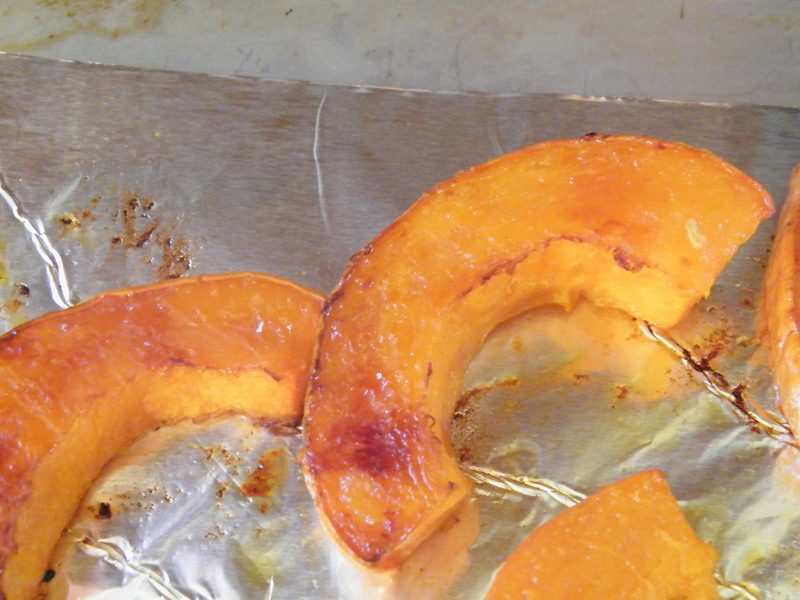 Before roasting your squash as above, toss with sliced shallots. 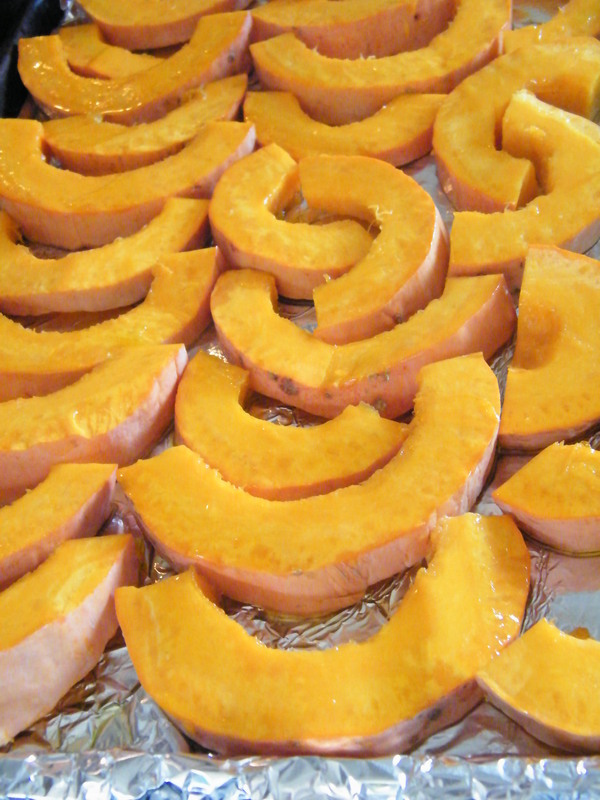 Roast squash and shallots for 30 minutes, turn squash slices, and roast until done (another 20-30 minutes). Immediately on removal from oven, sprinkle liberally with salt and pepper. If not done before cooking, peel before adding to salad (they will be HOT out of the oven. You’ll need to let them cool at least 5 minutes if not longer before doing this with your fingers, or you’ll need to use an oven mitt and/or a knife). While the squash is cooking, simmer the cider in a small saucepan until reduced to ¼ cup. The original recipe said 12 to 15 minutes, but it took me closer to 20. Let cool for 5 minutes. Whisk in the other ingredients. Slice the mizuna into bite-sized pieces. 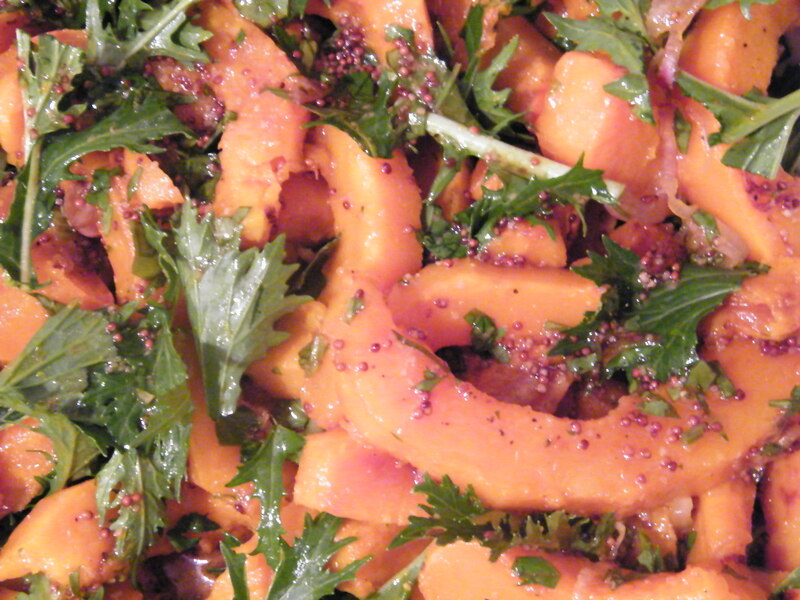 Toss with the peeled squash, and drizzle vinaigrette on top. This is the version we made (and loved!) but I couldn’t help thinking as I made it, and again as I was eating it, that dried cranberries, or pomegranate seeds, would be a great addition, and then while writing this up, I thought dried raisins, cherries, or even figs might be interesting, or toasted walnuts. The peppery sharpness of the mizuna goes so well with the sweet dressing – I thought it would be too sweet, but it was just what this squash needed to cut that funky mustiness I tasted when it was on its own. It’s a great little squash, but like many squash, I think it needs some spice or some sugar to cover up its less admirable qualities. Then again, don’t we all? Peel? Yes, though theoretically they’re edible if you like tough, chewy hunks of blandness in your food. Also, if they’re conventionally grown, they’ll most likely be coated in wax. So, you know, there’s that. Peel it. Worth the price of organic? Yes. Winter squash, because of its hard shell, is treated pretty liberally with insecticides, which can sink through the surface. It also has the tendency to draw certain harmful chemicals up out of the soil. Good for renewing the soil, not so good for your insides if you’re worried about that sort of thing. 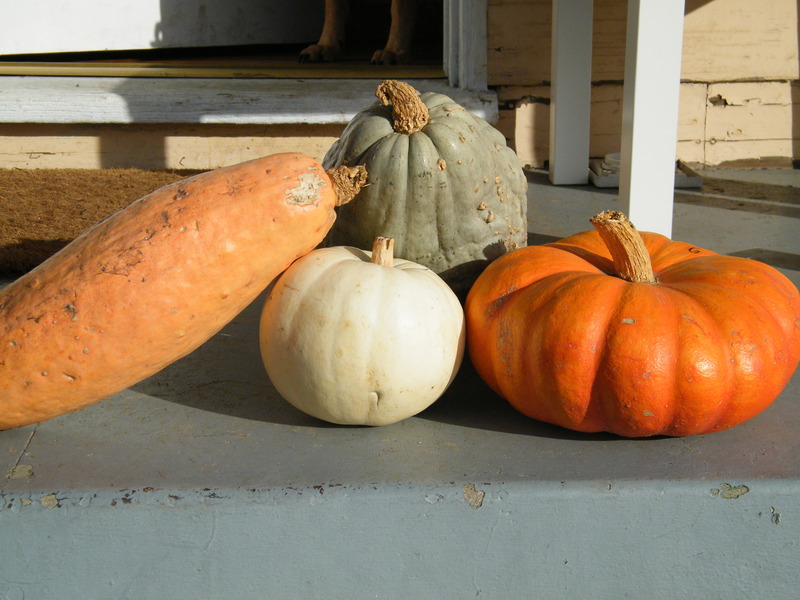 How to Store: Winter squashes will keep as much as 6 months or more if stored, uncut, in a cool, relatively shady spot, like a garage or cupboard. Once cut, it will keep wrapped in plastic in the fridge for a few days, perhaps a week. If it starts to get slime on the surface, toss it. Once cooked, it will keep in the fridge a few days if well wrapped.